Today's APOD is a suggestive image-mosaic that combines multiple images (obtained by the Telephoto-Lens Camera of the Mast Camera - or "MastCam", for short - located onboard the NASA - Mars Curiosity Rover and Laboratory) which were all taken with the aim to reveal a few fine details of the Downwind Face of "Namib Dune". This Site is part of the Dark-Sand "Bagnold Dunefield", a (relatively) small Dunefield found along the N/W Flank of Mount Sharp. Images taken from orbit have shown that the Dunes in the Bagnold Field move as much as about 3 feet (approx. 0,9144 meter) per Earth year. 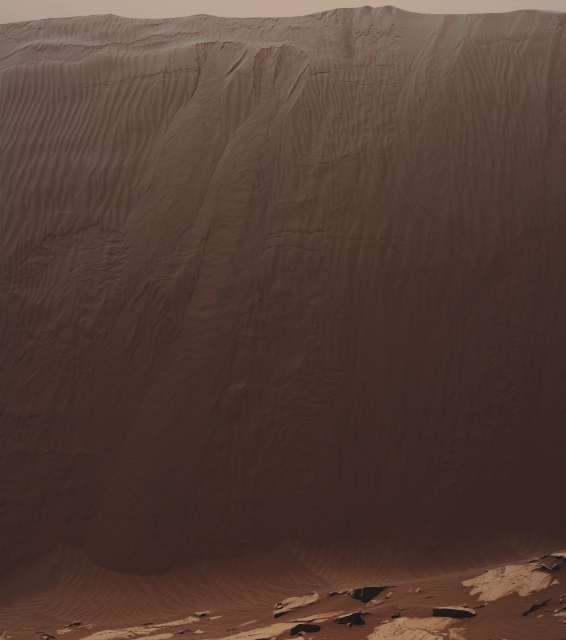 The Sand on this Face of Namib Dune has cascaded down a Slope whose inclination (as to the Surface) goes from about 26� to 28�. The top of the Face is about 13 to 17 feet (such as roughly 3,9624 to about 5,1816 meters) above the Rocky Ground - that can also be seen here, at its base. The Downwind Side of a Sand-Dune usually displays Textures which are quite different from those that can be seen on other Surfaces of the Dune itself. However, just like it happens on Earth, the downwind side of these Martian Dunes has a steep Slope that is conventionally called "Slip Face" (such as a place where the - always - accumulating Sand, flows in mini-avalanches down the aforementioned Face. The component frames of this image-mosaic were all taken during the 1200th Martian Day, or Sol, of the NASA - Mars Curiosity Rover and Laboratory work on Mars. The mission's examination of Dunes in the Bagnold Field, along the Rover's route up the lower Slopes of Mount Sharp, is the first close look at an Active Sand Dune anywhere, other than Earth. This picture (which is an Original White-Balanced Image-Mosaic obtained by the NASA - Mars Curiosity Rover and Laboratory on December, 21, 2015, and identified, on the NASA - Planetary Photojournal, by the ID n. PIA-20283) has been additionally processed, reduced in size to fit the page, Gamma corrected and then re-colorized in Absolute Natural Colors (such as the colors that a normal - in the average - human eye would actually perceive if someone were on the Surface of Mars, near the NASA - Mars Curiosity Rover and Laboratory, and then looked ahead, towards the Namib Dune and Sky above Gale Crater), by using an original technique created - and, in time, dramatically improved - by the Lunar Explorer Italia Team.